This voyage began in the middle of the 1990's in Moscow, when a group of artists and musicians led by Alexei Tegin and based at the legendary Fabrique of Cardinal Art commenced their studies of traditional ritual music, drifting away from the field of contemporary electroacoustic and industrial music with the intent to delve deeper into the ancient musical cultures of the ancient Egypt, Iran and Tibet. 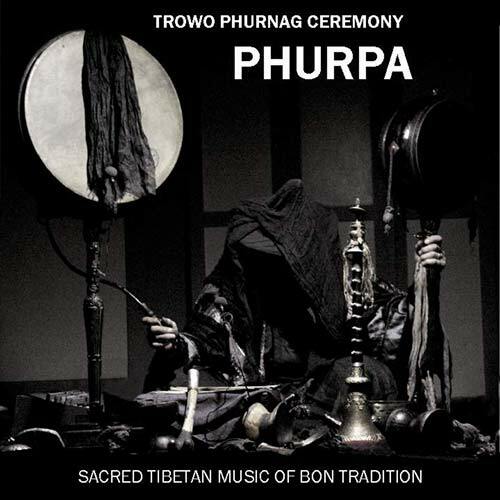 The original 2003 lineup of the project that emerged as a result was ubbed Phurpa (one of the five tutelary deities of the Father Tantra in Bon tradition), and all the members have carried on with their research in the field of Bon and Buddhist liturgies up to the present day. Before Buddhism reached Tibet, local people had practiced involved shamanic rites derived from various ancestral cults. Later on, circa the VI-IX century AD, a conflict between the local tradition, namely, the pre-Buddhist religion of Bon (which originates from Central Asia) and Tantric Buddhism (hailing from the North of India) gave birth to a unique cultural phenomenon known as Tibetan Buddhism, which combines an extensive metaphysical corpus and an advanced philosophical system with pristine ceremonial practices that reach down through many centuries. In the X-XI century AD the monastic ensemble came into being. It has got a lot in common with the Chinese court ensembles of the Tang dynasty; nevertheless, the Tibetan ceremonial ensemble has preserved its authenticity and kept a large number of primordial elements stemming from the ancient Tibeto-Burmanese music intact to this day. A typical ensemble usually includes a pair of nga drums, several rolmo cymbals and a pair of gyaling oboes, as well as telescopic dunchen horns, dunkar shells and short wandun horns. One of the unique features of the Tibetan monastic choir is a specific kind of overtone chanting, called "rgyud-skad", or the Tantric voice, which is based on the principle of the singer's transmogrification during the so-called "chanting meditation".